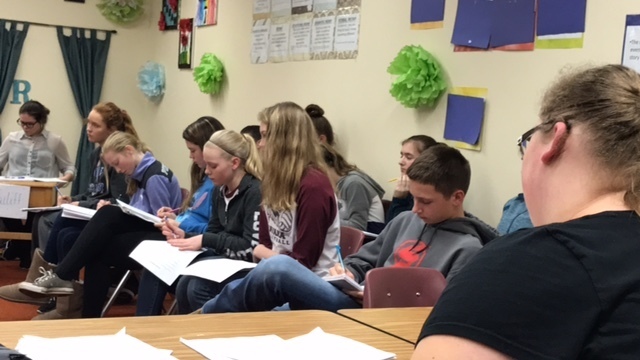 Recently, the eighth grade students in Mrs. Bals Language Arts Classes were given the task of studying the roles and functionality of a courtroom. Instead of taking the traditional approach, where students take notes as the teacher provides them the information she wants them to know. Instead she had them research the information themselves, but the learning didn’t stop there. 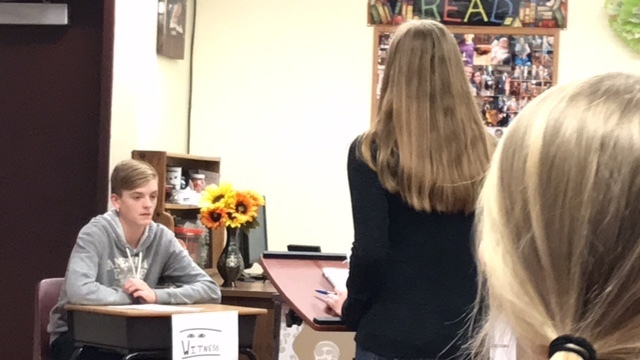 The students participated in their learning by taking on the roles of those involved in a courtroom setting and they transformed the classroom into a courtroom. Opening remarks were given, witnesses were called, a judge presided and a jury decided. The Havana #126 administration has been providing professional development training and promoting this type of instructional transition K-12 over the past few years. The teachers have responding with all types of creative and fun ideas to get their students engaged in the learning process by making learning fun. Research shows that student learn the material better when they are engaged and participating in their learning compared to “sitting and getting” the information. Above: the witness is questioned by the attorney. Above: The Jury is taking notes while listening to the testimony.